Thaw pastry sheet at room temperature for about 45 minutes, or until easy to handle. Slice apples cross wise into 1/4 inch slices. The puff pastry sheet is normally folded into 3 folds. Cut lengthwise at the fold into 3 long strips. 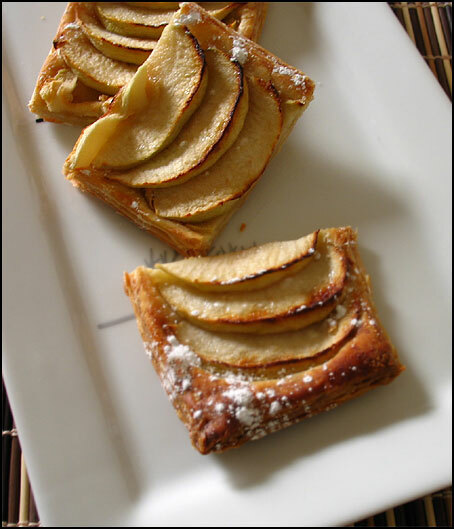 Place overlapping slices of apples diagonally down the middle of each tart and continue making diagonal rows on both sides until the pastry is covered with apple slices. Leave about 1 inch space at both ends of the sheets. Brush with melted butter and sprinkle 1 teaspoon sugar to each pastry sheet. 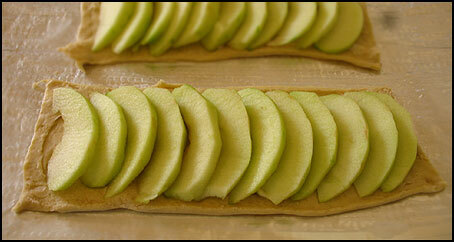 Bake for about 45 minutes to 1 hour or until the pastry is browned and the edge of the apples start to brown. When the tart is done, cool and dust with confectioners sugar. Don’t worry, when you take the apple tart from the oven, the apples may look quite dry. But it when you take a bite, it will be crunchy and juicy. I tend to reduce the amount the sugar. If you prefer, sweet you can sprinkle extra sugar before baking. Also the sweetness depends on the apple as well.